BornHack is a 7 day outdoor tent camp where hackers, makers and people with an interest in technology or security come together to celebrate technology, socialise, learn and have fun. Participants hack on their own projects, learn from each other, discuss, use, dissect and modify technology and much more. BornHack provides power, Internet, and other necessary infrastructure, the participants bring everything else. BornHack 2018 ends thursday, august 23th, 2018 at noon (12:00). Rented village tents must be empty and cleaned at this time, ready to take down. 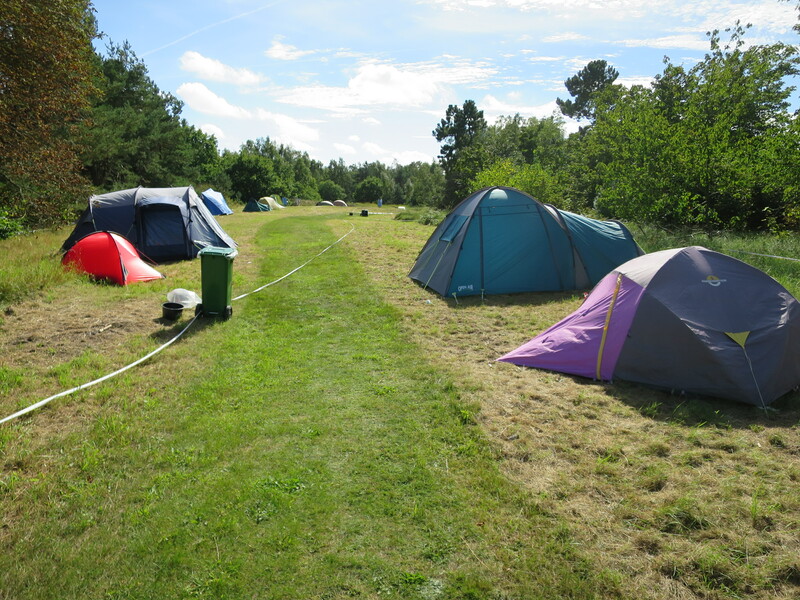 Participants must leave the site no later than 17:00 on the closing day (or stay and help us clean up). There are several ways to get to Bornholm from Copenhagen. A domestic plane departs from Copenhagen Airport, and you can get from Copenhagen Central station by either bus or train via Ystad or the Køge-Rønne ferry connection. You can check plane departures and book tickets at dat.dk. There are multiple departures daily. The flight takes approximately 25 minutes. You can drive over Øresundsbroen to Ystad or you can take the train/bus from Copenhagen Central Station. You can buy train and ferry ticket at dsb.dk (Type in "København H" and "Rønne Havn"). More information about the crossing. The crossing takes 1 hour 20 minutes. In total about 3 hours 15 minutes. Due to recent developments an ID (passport, drivers license or similar) is required when crossing the Denmark/Sweden border. Take the S-train to Køge Station (you need an "all zones" ticket) or travel by car. The ferry terminal is within walking distance from the station. You can check out prices here. It takes approximately 1 hour to get to Køge. The crossing takes 5 hours 30 minutes. 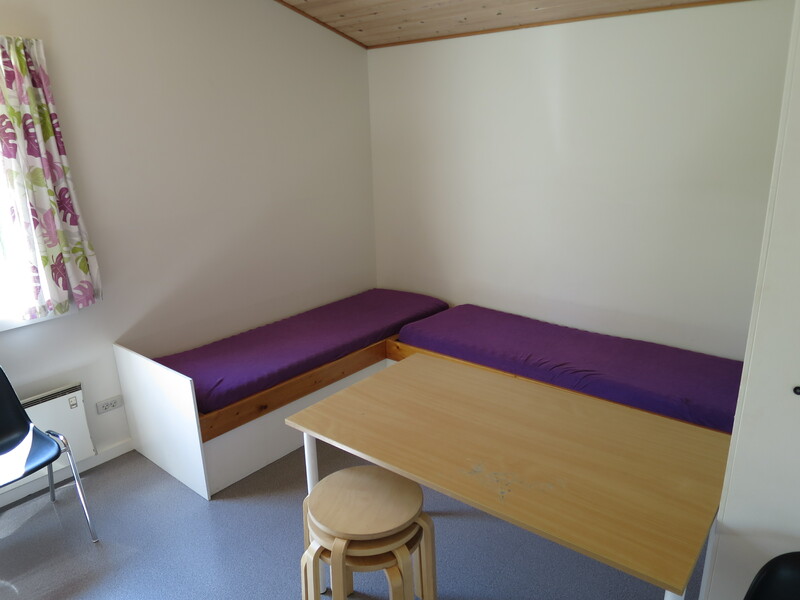 You can take Rute700 from DGI Byen (next to the Central Station) to Rønne Havn, it takes just under 4 hours and is priced at 300DKK for an adult - See rute700.dk for booking. To get to Bornholm from Malmö you may take a train from Malmö to Ystad and the ferry from Ystad to Bornholm. Skånetrafiken runs trains from Malmö C to Ystad every 30 minutes. Trains leave at 08 and 38 minutes past the hour. Go to skanetrafiken for details. The ferry from Ystad to Rønne leaves four times per day. Morning: 08:30-09:50 Noon: 12:30-13:50 Afternoon: 16:30-17:50 Evening: 20:30-21:50 Booking the ferry tickets prior to departure can drastically reduce the price. See "Getting from Rønne to the Venue" final step. If you are going to BornHack from abroad you have different options as well. There is a direct ferry taking cars going from Sassnitz ferry terminal which is 4km away from Sassnitz itself. The company is called BornholmerFærgen and the tickets cost 32€ (outgoing) and 25€ (return). It can also be booked from aferry.co.uk. The ferry departs for Bornholm on Aug 27 at 11:50, 13:30, and returns to Sassnitz on Sept 03 at 08:00, 09:00. 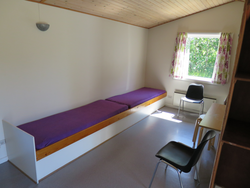 Detailed timetable: English, Danish. There is a passenger ferry from Kolobrzeg to Nexø havn. The venue is 24km from Rønne and you can take bus number 8 all the way. It departs from the harbour on even hours at thirteen past the hour. After about forty minutes, get off at the stop called Vestre Sømark and walk the rest of the way to Jarlsgård, a distance of just under 500m. We also have a shuttle bus service that can pick you up and bring you to the venue. 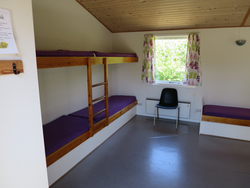 You can call the BornHack phone on +4531550497 to book this. Local taxis can also get you here. The company operating on Bornholm is called Dantaxi and the phone number is +4556952301. A car is very convenient when bringing lots of equipment, and we know that hackers like to bring all the things. We welcome cars and vans at BornHack. We have ample parking space very close (less than 50 meters) to the main entrance. Please note that sleeping in the parking lot is not permitted. If you want to sleep in your car/RV/autocamper/caravan please contact us, and we will work something out. BornHack is first and foremost a tent camp. You need to bring a tent to sleep in. Most people go with some friends and make a camp somewhere at the venue. See also the section on Villages - you might be able to find some like minded people to camp with. We rent out a few cabins at the venue with 8 beds each for people who don't want to sleep in tents for some reason. A tent is the cheapest sleeping option (you just need a ticket), but the cabins are there if you want them. Go to the shop to book a bed or a whole cabin. At BornHack we have bicycles available to borrow for free. They come with helmets, locks and lights. Noone should spend a week on Bornholm without seeing a bit more of the island. If you want to go sightseeing, grocery shopping, or just feel like riding a bicycle, you should take advantage of this offer. 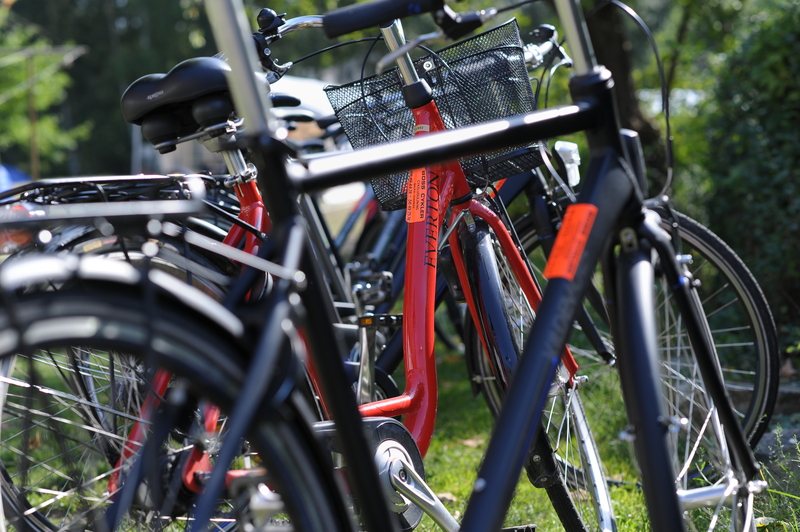 To book one or more of the bicycles go to the infodesk and make a reservation. It is free. Caravans, autocampers and other sleep-in cars are welcome on BornHack. 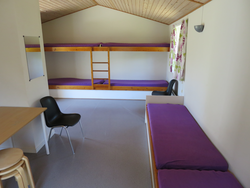 The area north of the cabins is a combined caravan and quiet area. It is also possible to place caravans in the south near the entrance if you want to be a bit noisy. It will not be possible to arrive or depart caravans during the event except special cases. It is too dangerous to have people driving about on the venue. We do not have facilities for emptying the chemical toilets used in caravans. It is possible to get a power hookup for the caravan, but see the Power section of this page regarding plug types. You do not need an extra ticket or anything but please let us know by mail if you intend to bring a caravan or other sleep-in veichle. Note that it is strictly forbidden to sleep at the parkinglot south of the main entrance due to fire safety rules. We know that hackers like to cook for themselves for many reasons, not limited to vegetarians/vegan diets. Everyone is encouraged to cook their own food, either in their own village kitchen or in the food area. Please note that coal powered barbeques are strictly forbidden on the camp grounds for fire safety reasons. If you want to cook with coal use the big barbeques in the food area! Gas and electrical barbeques are allowed in villages, as are gas burners and cooking plates/hotplates. However, fire safety is very important at a tent camp. Thus, if you have an open flame in your village, you have to make sure that the area under the flame cannot catch fire. Place your gear on bricks/blocks, and avoid having a really bad day. By popular demand our food vendor Simon will return with his high quality locally sourced sausages and burgers (including vegan options). Compared to last year the menu has a few new items to look forward to. Simon will be open all 7 days from 12:00 to 20:00. 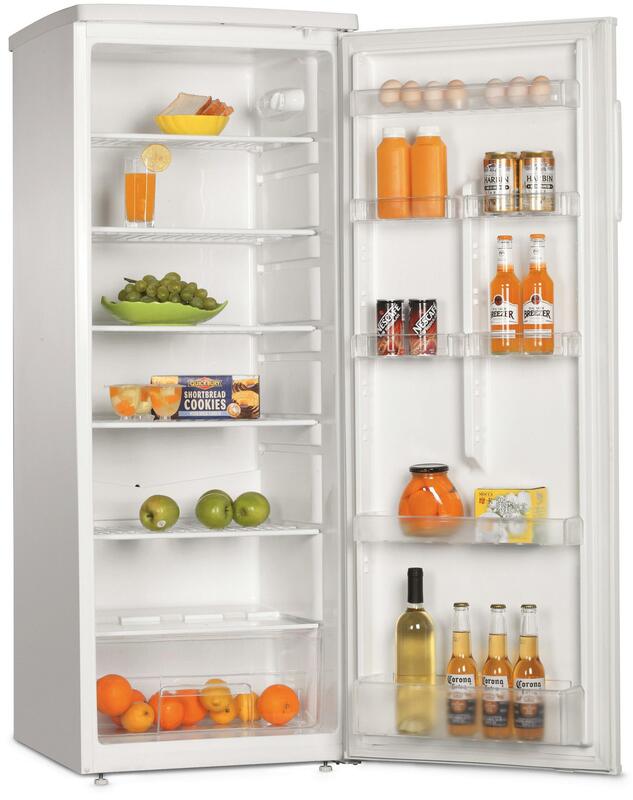 It is possible to rent a shelf or drawer in the fridges provided in the Food Area. If you rent all 6 shelves of a fridge as well as the drawer you can take the fridge to your village. Go to the shop to order. You are also welcome to bring your own fridge or cooling box as you see fit. Before you can cook anything you need to get some groceries. 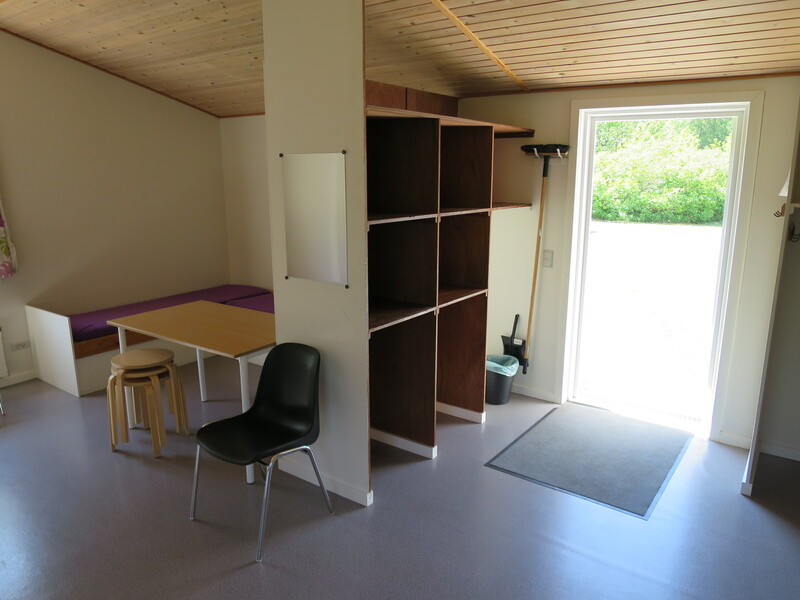 The closest place to buy groceries is Dagli'Brugsen (07:30–19:00) approximately 3.5 km away at Pedersker. About 7 km from the venue there is a larger selection at Aakirkeby. There you can find SuperBrugsen (08:00–20:00), SPAR (08:00–20:00) and Netto (07:00–22:00). About 20km from the venue at Nexø there is an even larger selection still. We have a shuttle bus that will transport participants to and from grocery shopping, free of charge. See the shuttle bus section for more info. 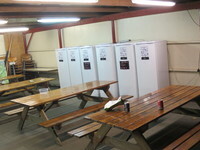 Part of the food area is a large outdoor kitchen area where participants are invited to cook their meals. Lots of seating. Both covered by roof and in the open. Running hot and cold water and tables for food preparation. You must bring your own dishes and other cooking/eating equipment. Ample barbeque capacity, including a barbeque exclusive to vegans/vegetarians. We sell charcoal in the kiosk. 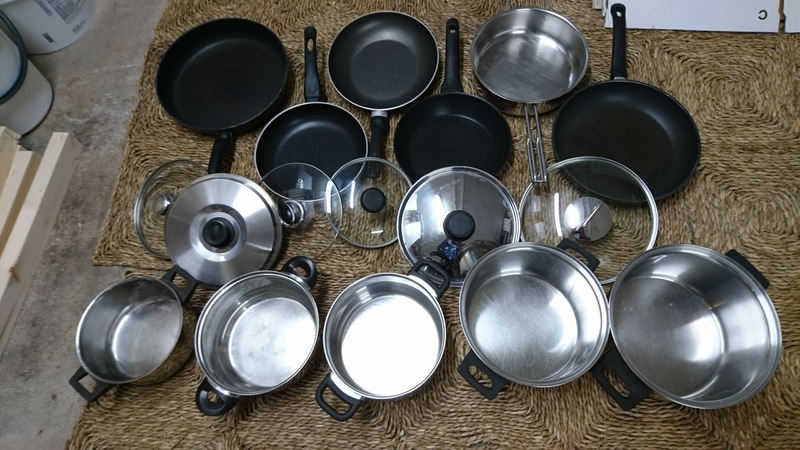 A bunch of pots and pans for your boiling and frying needs (picture below). Hot plates for heating said pots and pans. 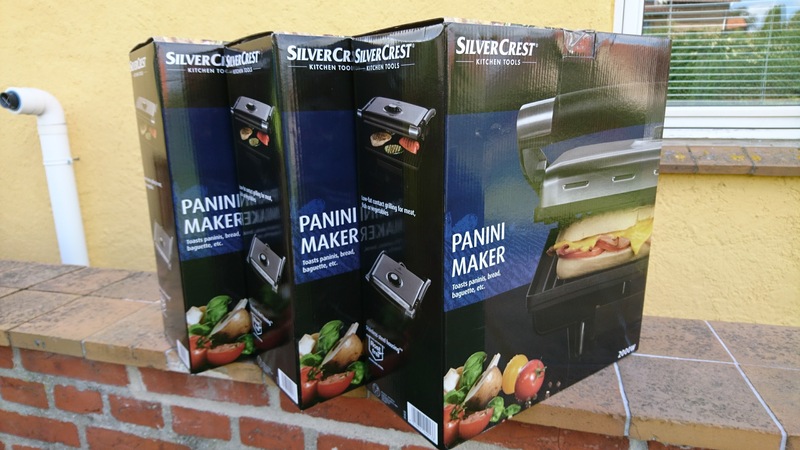 A set of toastie/panini/whatever makers (picture below). A couple of microware ovens. Vegans and vegetarians are welcome at BornHack. Our food vendor sells vegan sausages and burgers. You can also cook your own food in the food area, where we have a large (1 meter diameter) barbeque reserved for vegan and vegetarian food. CERT is short for Community Emergency Response Team. In case of a dangerous situation (accidents, fire and so on) these are the people to contact. While the infodesk is open (from 12:00 to 20:00 every day) the CERT people can be reached here. Outside infodesk opening hours CERT can be reached at the official BornHack phonenumber which is +4531550497. This number is open 24 hours. Although a very small creature, it can do a lot of damage. So make sure to check yourself for any ticks that might have latched on to your body (a good time is when taking a shower). If you discover any and don't have the tools to get rid of it properly, go to the infodesk and borrow a tick remover. This larvae has made the headlines for every year BornHack has been held so far, luckily without any incidents at BornHack itself. The hairs on the pine processionary cause a quite bad reaction in mammals, and should be removed as quickly as possible - tape can be used to get rid of the hairs. Contact CERT or an organiser if you find any of these! 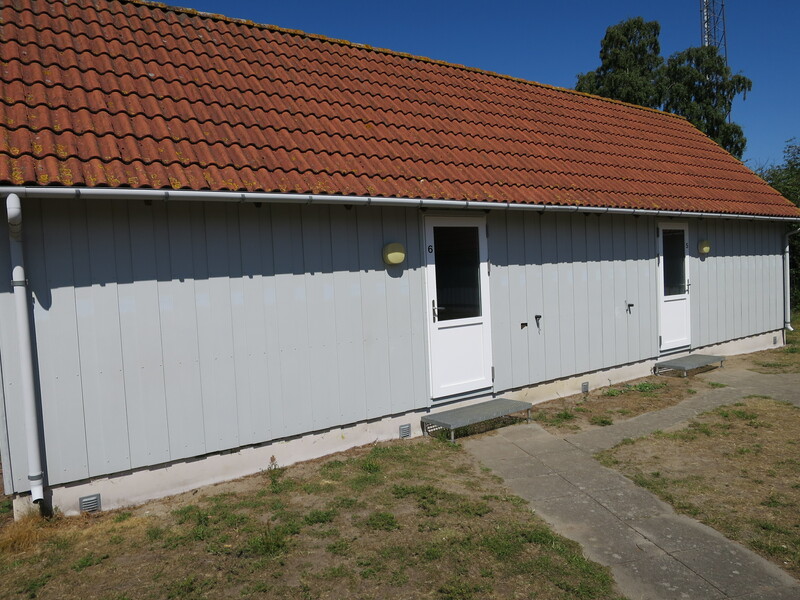 BornHack will have a 1Gbit fiber uplink to the outside world generously sponsored by BornFiber. We have requested a temporary IP assigment from RIPE NCC on both IPv4 and IPv6 so there will be public IP space for every device. BornHack will have both wired and wireless networks. The default networks will run with public internet addresses (v4 and v6) so you must protect yourself with a firewall at all times. The wired network will provide DHCP but also allow manually configured IP addresses, using peg DHCP (RFC 2322). If you want to set up servers we recommend to do so with static IP's. You can also use static configuration on clients to avoid attacks involving rogue DHCP servers and similar. There will be multiple wireless networks, using standard IEE 802.11 5GHz and 2.4GHz. We will provide a wireless networks which is put behind NAT, which is similar to usual guest networks. NOTE: NAT IS NOT SECURITY, use caution always - turn the firewall on. We will also provide a wireless network without NAT. One SSID will be configured to use WPA Enterprise with 802.1x aka EAP-TLS - where any credentials can be used. There is no central user management or account creation, we just use EAP-TLS to get the encryption it provides for individual users. We are trying to cover a large area with wifi, and thus limit noise and conflicting signals, so we kindly ask to NOT setup your own wifi. We are working on sorting out the details. Plugs will be standard European 230V supply with Danish type K plugs. Standard red 400V 16A CEE plugs will also be possible (but please contact the organizers to make sure). If you make sure to bring ~30m power cord, you should have no problem finding a camp site. Also, remember that you can ask the camp next door if you can connect to their power. BornHack has nice shower facilities. The showers will be cleaned twice daily and should be more than sufficient for our needs. The showers not divided into genders (unisex) since they are individually lockable. The showers are permanent installations, inside a real brick house - they are not temporary showers put up for the event. The toilets are unisex like the showers. The toilets will also be cleaned twice per day, so they should be nice. Like the showers, the toilets are also permanent installations inside a brick house. A year may come when we have to use porta potties at BornHack, but it is not this year! The BornHack shuttle will be available for transporting participants to and from Rønne (the ferry terminal or the airport) to the venue at prearranged times. The shuttle holds 4-6 passengers and normal luggage for 4 people (it's probably going to be a stationcar-ish one). If you have large stuff, please let us know so that we can coordinate with a larger car for those things. To let us know you need transportation, please e-mail shuttle@bornhack.org with identifying information (eg. your name or handle), information about what ferry or airplane you are arriving or leaving on and lastly, how many you are and roughly how much stuff you are bringing. You can also call the BornHack phone at +4531550497, but e-mail is preferred. Please e-mail or call us at least 24 hours in advance, so that we can coordinate and make sure there is someone to pick you up. The shuttle will also be available for grocery shopping. During the event the shuttle will be taking participants to and from grocery shopping. We are aiming at a grocery run before lunch and one in late afternoon and the times will be coordinated so that they do not clash with the ferry or airport pickups. Times will likely be with departure from the venue at 10:30 and 16:45. To book a ride on the shuttle go to the infodesk. The drivers are flexible so if you prefer a specific grocery shop just get consensus from the other passengers. The shuttle can't wait outside for hours while participants are shopping. You need to pick up your groceries in max. 20 minutes. We might do a longer one with about 1 hour to do the shopping on the first or the second day (most likely the afternoon one), for those that would like to shop for all days in one go. Please let the info desk know when you arrive, if you are interested in this. The bar area is the place to go when you are all hacked out and want to socialize with the other participants. Enjoy a cold beer or drink and some music, and discuss your projects with the people around you. Opening hours will be compatible with the average hackers drink/sleep cycle. The Main Entrance is at the bottom of the map. This is the only way to enter and exit BornHack for participants. 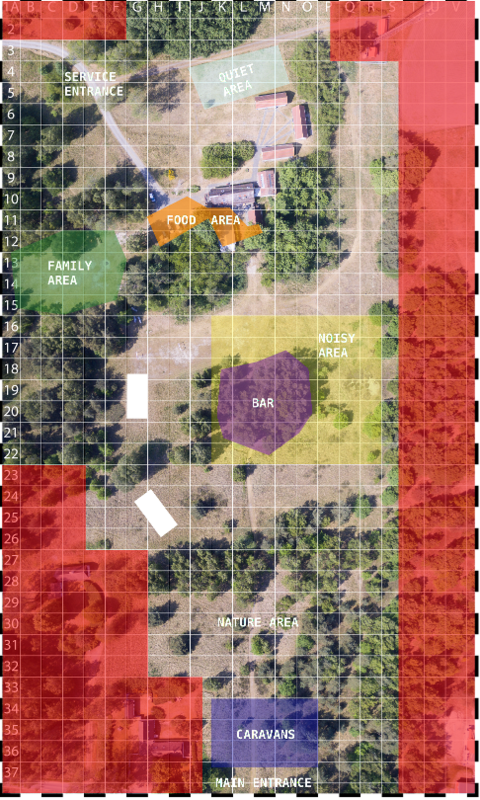 The dark blue square in the botton is the Caravan Area. All caravans, campers and cars for sleeping in should stay in this area. The red areas in the edges of the map are off limits and not part of BornHack. The white squares represent the Speakers Tent. The yellow square in the middle is the Noisy Area which also contains the bar marked in purple. Everything from the tree line at 27 going south all the way to the entrance is part of the Nature Area. This area has uncut grass, trees and flowers for the nature lovers. The green blob in the left side around 12-15 A-F is the family area. The orange bit around row 10-11 is the Food Area. It contains the ourdoor kitchen and food vendor described elsewhere on this page. The house at K10 to L10 is where the workshop rooms can be found. They are on the first floor, use the staircase from the Food Area. 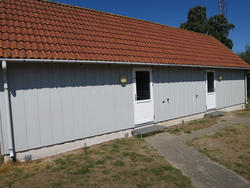 The bulding in M9 is the toilet and shower building. The light blue square at row 4-5 J-M is the Quiet Area. Please avoid noise in this area! If this is your first hacker camp the term 'Village' might be confusing but it is fairly simple: a village is just a spot on the campsite where you and a bunch of your friends/like minded people camp together. Apart from peoples individual tents which they sleep in, many villages bring a large common tent where they can hack and hang out during the day. You don't have to stay in a camp if you don't want to, putting up a tent somewhere by yourself is perfectly fine. Having a camp with friends without calling it a village is also fine. You can register your village here! If you don't want to make your own village you might be able to find and join one that suits your interests. Get in touch with the villages team if you have any questions! Villages can also rent village tents via us. The tents will be ready when you arrive and will be taken down again after you leave. The tents have optional floors and you can rent folding tables and chairs as needed. You do not have to register a village or have a concept to rent a big tent.